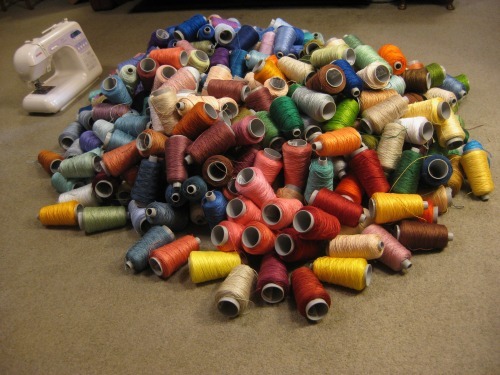 I’ve got more embroidery thread than anybody….. 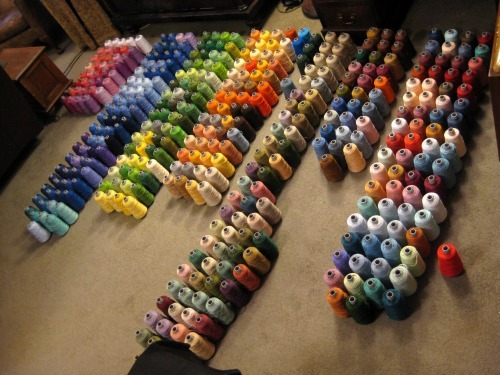 I know that stitchers often like to talk about their stash. After all collecting fabric, thread, kits and charts can be almost as much fun as stitching! However, when you run your own embroidery kit business, you’d think that that feeling might have to be ‘toned down’ a bit, maybe? Well, if it should, then I’m not very good at it! I was looking on Facebook, as you do, and someone in an embroidery group mentioned an online trade auction that was due to end in two days’ time. It was the closing stock of a UK distributor of needlework and knitting supplies. I had a quick look, just out of interest, you understand….and couldn’t believe what I saw. 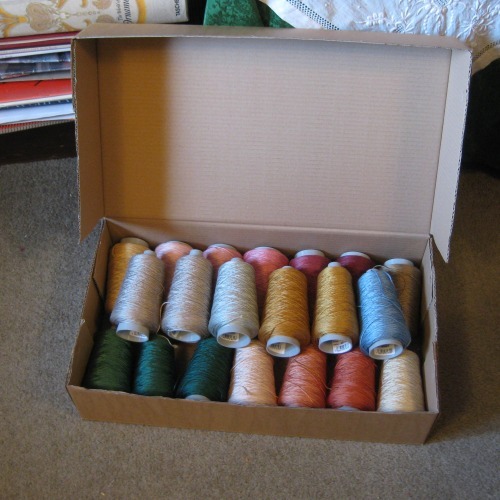 Hundreds of bulk cones of thread, the same as I use in my kits, with an opening bid that was a fraction of the trade price. So, I thought about it overnight, then started bidding the morning that the auction was to finish. I’m not very patient when it comes to bidding, but I AM very determined. So when a few people bid against me, I used tactical bidding to still win what I wanted, at a really good price. I could look at them for hours! I’ve already got ideas for how I can use them for new designs, as there are some colours in this selection that I’ve never stocked before. Author Janet GrangerPosted on July 21, 2016 July 20, 2016 Categories ThreadTags Anchor stranded cotton, Crafts, Embroidery, Needlepoint9 Comments on I’ve got more embroidery thread than anybody…..